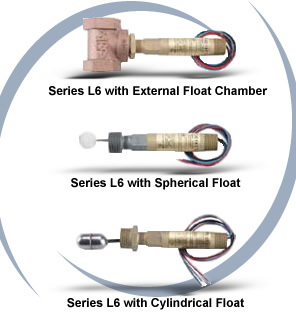 Surprisingly compact, the Flotect® L6 is designed and built for years of trouble-free service in a wide variety of process liquid level applications. Operation is simple and dependable with no mechanical linkage as the level switch is magnetically actuated. The float lever pivoted within the body moves when the process liquid displaces the float. A magnet on the opposite end of the float lever controls a second magnet on the switch actuating lever located in the switch housing. Float: Solid polypropylene or 304 SS. Lower Body: Brass or 303 SS. External Float Chamber (Tee): Matches lower body choice of brass or 303 SS. Other: Lever Arm, Spring, Pin, etc. : 301 SS. Temperature Limits: -4 to 220°F (-20 to 105°C) standard, MT high temperature option 400°F (205°C), (MT option not UL, CSA or ATEX). ATEX compliant AT option ambient temperature: -4 to 167°F (-20 to 75°C) process temperature: -4 to 220°F (-20 to 105°C). Enclosure Rating: Weatherproof and explosion-proof. Listed with UL and CSA for Class I, Groups A, B, C and D; Class II, Groups E, F, and G. (Group A on stainless steel body models only.) ATEX 0344 II 2 G EEx d IIC T6 Process Temp≤75°C. EC-Type Certificate No: KEMA 04ATEX2128. Electrical Connections: UL models: 18 AWG, 18" (460 mm) long. CSA and ATEX models: terminal block. Upper Body: Brass or 303 SS. Conduit Connection: 3/4" male NPT standard, 3/4" female NPT on junction box models. Process Connection: 1" male NPT on models without external float chamber, 1" female NPT on models with external float chamber. Weight: Approximately 1 lb (.5 kg) without external float chamber, 1.75 lb (.8 kg) with external float chamber. Specific Gravity: See column on Model Number chart. Sensitive to level changes of less than 1/2" (12 mm). Options Not Shown: 1-1/2" and 2" male NPT process connection, 2" female NPT connection tee, and top mount.